A GreenPoint Rating, the gold standard label for green homes. A GreenPoint Rated label is a sign of quality construction, beauty, comfort, and health—the health of people as well as the health of the planet. GreenPoint Rated homes can also mean savings— savings on utilities, maintenance, and repairs, reductions in greenhouse gas emissions, and conservation of natural resources. 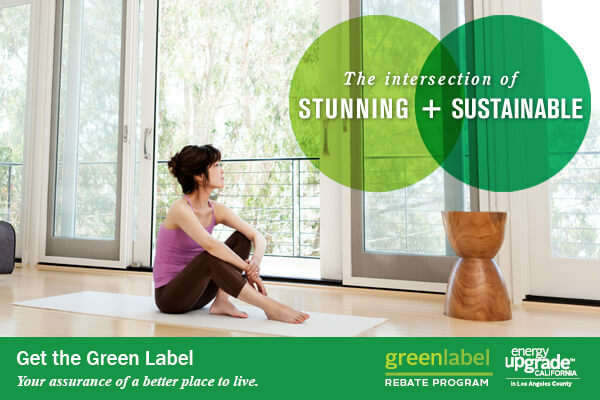 The GreenPoint Rated label also represents the gold standard in green home certification. The label is ideal for homeowners committed to ensuring their home meets high environmental standards. Like a report card for green homes, GreenPoint Rated assigns points based on five categories: Energy Efficiency, Resource Conservation, Indoor Air Quality, Water Conservation and Community Benefits. Point values are awarded based on the use of green construction practices and sustainable materials that exceed California’s code requirements. Enter the Green Label Sweepstakes. In this sweepstakes, one lucky Los Angeles County homeowner will win a free GreenPoint Rating. A GreenPoint Rater will help you evaluate your home and the points awarded for your green home features. Your home must achieve a minimum point value in order to qualify for the label. Learn more about GreenPoint Rated. Even if you don’t win the Sweepstakes, you may still be eligible for up to $2,000 in rebates to help pay for a green home label and up to $8,000 in rebates and incentives to help pay for energy upgrades. Learn more about additional rebates available. Even in tough economic times, homes with green labels are more valuable, retain their value better and are attractive to a growing number of homeowners and buyers. Seventy percent of home buyers are more inclined to buy a green home than a non-green home, even in a down economy. The GreenPoint Rated label can even improve your property value and help your home sell faster at time of sale (LA Times, 2011). Homes account for 17 percent of all greenhouse gas emissions according to the U.S. EPA. To date, California’s 10,000+ GreenPoint Rated homes have saved over 112 million gallons of water — enough to fill MacArthur Park Lake five times over — and avoided nearly 9,000 tons of greenhouse gases, the equivalent of taking more than 1,500 cars off the 405 freeway for an entire year. GreenPoint Rated is recognized by the California Energy Commission and the Environmental Protection Agency. First, TAKE THE QUIZ (mandatory) to find out whether your home has the green features needed to earn a GreenPoint Rated label. If you reach the minimum point value, you are eligible to enter into the sweepstakes to win a free rating and GreenPoint Rated label for your home! Then, for every action below that you complete, you’ll receive additional entries. Click each individual action to enter yourself. For actions you have done in the past (i.e. you already follow @GreenPointRated or @RonandLisa on Twitter) just click directly on ‘I did this’. The eligibility of the winner will be verified by The Healthy Home Dream Team(TM). You may tweet or share on Google+ or your Facebook wall for an entry once per day. All other actions will only be counted once. You must be 21 or older and be a Los Angeles County homeowner to win. Contest ends 5/9/12 at 12:01am ET. Click here for complete terms and conditions. And we LOVE our readers :)) Thank you Irene & best of luck in the Sweepstakes!! Ron and Lisa, you guys are my source for my healthy home! Thank you! Cool sweepstakes! Thank you for your support Spencer. And, best of luck to you in the sweepstakes – only two weeks remain until one lucky winner is awarded a $2,000.00 green home certification for their home!! We appreciate you dropping by. Be green & be healthy! ANNOUNCING…We are thrilled to announce the (3) lucky finalists in the Green Label Sweepstakes have been selected. They are: . Stay tuned to find out who the GRAND PRIZE winner will be! Good luck to all three! DRUM ROLL PLEASE….We have a GRAND PRIZE WINNER in the Green Label Sweepstakes. Join us in congratulating Ryan Harty! Ryan is enjoying a Green Point Rating on his home as we speak (uh, errr…type)! A very special thanks to the folks at Green Point Rated for making this world a greener place to live!